My all day soundtrack are waves brushing onto the sand. I can’t sleep much past 7am after my month on ashrams and so around this time, I’m up. The floor of my little beach hut is on a heavy slope toward the door and so I nearly roll right out to the porch. There is enough room inside for my suitcase, my friend’s suitcase and a double bed. On the other side of its one wall is a leaky toilet, a cold water shower and newborn-baby-size sink. It’s the kind of hut that the big bad wolf could huff and… I’m not sure he’d even have to puff before he blows the whole thing down. Capitalizing on my inability to sleep in and the coolness of the relatively early morning, I walk along the tide to Mandrem beach, a little over a mile away. The beach is quiet with scattered individuals engaged in various morning practices from calisthenics to yoga and tai chi to joggers and fishermen. I return for a meditation and a rest and watch two men and two women pull silver fish from their green net and drop them into a bucket. Cloudy, one of the young guys who works at Orange Sky Beach Huts, calls my name. I look over and he’s smiling ear to ear holding up a fresh-caught and bought silver fish from its tail. Cloudy looks about 18 years old, but my guess is he’s a bit older. He’s got a surfer kid vibe about him with rainbow-mirrored glasses to complete the look. He has a sensibility and work ethic that leads me to believe he’s in his early 20s. He sits next to me and asks why I’m so tired. This eventually leads him to ask if I need any "party favors" for the festivities that will begin soon for India’s colorful holiday, Holi. Many women selling sarongs see my white skin and flock to me like thrown-catch to seagulls. Without a tan, they think I must be new to the beach and want to see how much money I’ll spend on one of their sarongs. They all sell them for the same price of 100 rupee. They will claim it is their “best, special price for their golden customer only.” Spend about 10 minutes on the beach and you will be offered this price without any haggling at least three or four times. I say no and Julia persists. She sits next to me and converses with the regular “where are you from?” formalities. She offers to give me a massage for 300 rupees. I realize the sarongpreneurs will do just about anything for money and for so little money as far as where I come from. I soften a bit. I notice her bright white teeth. I am sure that Julia’s life isn’t even a small fraction of the luxury that we in the states experience on any normal day, yet her teeth glow and face is pristine. I ask her about her teeth. Do I “need eyebrows”? No. Not only do I not need to have my eyebrows cleaned up, but I’ve been enjoying the past four weeks of not shaving my armpits. Since my armpit hair began growing around age 16 I’ve been a weekly shaver. I have the idea that baby skin is the best. Now that I have hair that you can see from a few feet away, I can see that it doesn’t scare anyone away, at least not in India. I’m tickled by her persistence and creative sales technique. I agree that I “need eyebrows.” It is the equivalent of $2.50 and I have shaped-brows. For an extra 50 cents my invisible mustache is also made to still be invisible. 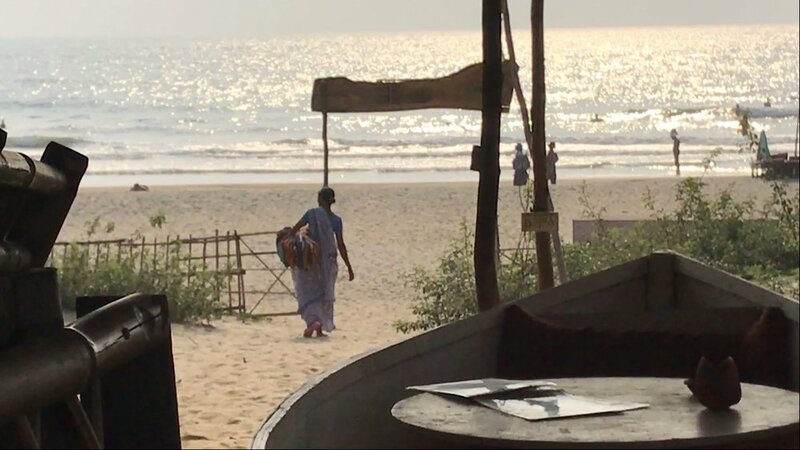 I retreat from the beachfront to get peace from the wandering saleswomen. “Cloudy, do you have charcoal?” I inquire. “You want to whiten your teeth?” He asks. Charcoal is not such a secret here. He gives me an espresso cup with a chunk of charcoal in it and instructs me to use water and put it on my teeth every morning.